To return to Susannah Greenberg Public Relations, click here. Eric DelaBarre is the author of Saltwater Taffy, a middle grade novel to be published in January 2011 (illustrated by R.C. Nason). DelaBarre is an award-winning filmmaker who began his career on Law & Order. Saltwater Taffy is his first novel for children. In part inspired by Waiting for Superman, the powerful documentary about America's failing public school system, Eric DelaBarre is planning a 23 city tour to schools and Boys and Girls Clubs of America. DelaBarre is past president of the Boys & Girls Club Council of Santa Monica. With the tour, the author will promote education and literacy through speaking and giving away his new book, Saltwater Taffy. Saltwater Taffy is a story of adventure that teaches valuable life lessons as it entertains. It has been endorsed by nine Teachers of the Year, the editor of the Journal of Clinical Child & Adolescent Psychology, as well as a producer of the blockbuster film, Avatar. The author's tour will include 'dropout factory' schools like those featured in the movie Waiting for Superman. He will also be signing books at local bookstores. DelaBarre will visit schools close to his Santa Monica home, in East and South Central Los Angeles, as well as cities in Tennessee, Alabama, Arizona, Nevada, Colorado, North Dakota, Louisiana, Texas and Washington state. Some of the cities such as New Orleans and Port Townsend are featured locales in the book. In March, DelaBarre plans an East coast tour. Of Related Interest: What is a dropout factory? ERIC DELABARRE is an award-winning filmmaker, speaker, and most recently a best-selling ghostwriter for Random House/Harmony Books. Eric began his career with Universal Studios on NBCs mega-hit drama, Law & Order. His work has been sold around the world and showcased on HBO, Cinemax, Showtime, Starz/Encore, USA Networks, and NBC. He is the author of Why Not: Start Living Your Life Today, and past president of the Boys & Girls Club Council of Santa Monica. He lives and works in Santa Monica, California with his wife, Julie DelaBarre, www.juliedelabarre.com, a spokesperson for Dole.com and a full-time nutritionist. R.C. NASON, illustrator of the book, a professional artist for more than twenty years, is the recipient of the Hans Christian Anderson Award for Thumbelina. With extensive film credits for illustrating and painting for animated feature films, Rob specializes in translating a story line into exciting visuals. He has work with companies such as 20th Century Fox, Harper Collins, Hallmark and Sony, to name but a few. When away from his studio, he is sketching in the field for discovery and research, usually in the Lakes Region of New Hampshire or northern Ontario. Canadian by birth, Rob currently lives in the United States, with his wife Nancy, and shares each adventure of his life with his two boys, Nick and Cody. "A pure joy to read and explore. It feels like a pleasure trip to Treasure Island with The Goonies. Its a great inspiration adventure for young minds and those still young at heart." "Entertains and educates. Its Indiana Jones meets Stand by Me. I love it." "This is a fast-paced thrilling tale of adventure sure to please even the most reluctant of readers! DelaBarre uses his extensive film and television storytelling talents to draw readers right into the story." "With great friends, epic adventures, and poignant life lessons along the way, Saltwater Taffy will touch your heart, at any age." SUBJECTS: Tweens, Literacy, Education, Middle School, Middle Grade, Childrens Books, Youth, Children, Teachers, Young Adult Literature, Juvenile Fiction, Reading, Books, Authors. 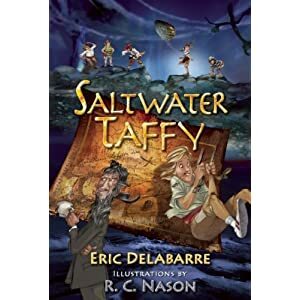 INTERVIEW: Eric DelaBarre, author of Saltwater Taffy, a Middle Grade novel to be published in January 2011 (available nationwide, distributed by Perseus Distribution). DelaBarre is an award winning film-maker who began his career on Law & Order. AVAILABILITY: Nationwide by telephone. Travel by arrangement. And tour cities/dates. January 5-10 Los Angeles area schools. MARCH  East Coast tour. TBA. MEDIA CONTACT: For further information, to schedule an interview, or request review copies, use this convenient form, or, if you prefer, contact Susannah Greenberg, Susannah Greenberg Public Relations, at (212) 208-4629 or publicity@bookbuzz.com.